Wreckage of the fuselage. Credit TAIC. On 9 March 2013 a Robinson Helicopter Company (Robinson) R66 helicopter crashed in the North Island's Kaweka Range after experiencing an occurrence known as a 'mast bump'. A main rotor blade then struck the fuselage, causing the helicopter to break up in flight. The pilot, who was the only person on board, was killed. The weather was suitable for the flight, which was conducted under visual flight rules in uncontrolled airspace. However, the wind strength had increased during the day, leading to patches of moderate turbulence in the mountainous terrain. It was very likely that turbulence was a factor in the accident. The helicopter's light gross weight and relatively high speed at the time would have exacerbated the effects of any turbulence. The Commission found that this accident, when considered alongside four other R66 accidents that have occurred globally in the five years since the helicopter type was introduced into service in 2010, suggested that the R66 was as vulnerable as the smaller Robinson R22 and R44 types to a catastrophic mast bump under certain conditions. The R66 has the same main rotor system design as the' R22 and the R44. The R66 was certificated by the Federal Aviation Administration of the United States without any special training requirements like those that are mandated for pilots of the R22 and the R44 to reduce the risk of mast bump accidents. That was in spite of having the same main rotor design and a similar response to low G conditions as the R22 and R44. The Civil Aviation Authority of New Zealand accepted the Federal Aviation Administration type certificate for the R66 in April 2011, and also did not require special training for R66 pilots. A safety issue arose as a result of there being no special training. A helicopter pilot (or trainee) with no prior experience of flying one of the smaller Robinson types could fly the R66 without necessarily having the knowledge and training that the Federal Aviation Administration acknowledged was essential for pilots of all Robinson types. There was also a risk that a pilot who did have prior R22 or R44 experience would infer, from the lack of any special training requirement, that the R66 did not require the same careful handling as the smaller types. Recommendations were made to the Administrator of the Federal Aviation Administration and the Director of Civil Aviation to require additional training as a prerequisite for an R66 type rating. It is likely that mast bump accidents with Robinson helicopters will continue to happen unless the dynamic behaviour of the main rotor preceding such a catastrophe is fully understood. A recommendation was made to the Administrator of the Federal Aviation Administration to reinstate uncompleted research into the dynamic behaviour of lightweight helicopter main rotor systems. A further recommendation was made to the Director of Civil Aviation to publicise the recent amendments to the Robinson R66 and R44 Pilot's Operating Handbooks that caution against flight in high winds and turbulence. 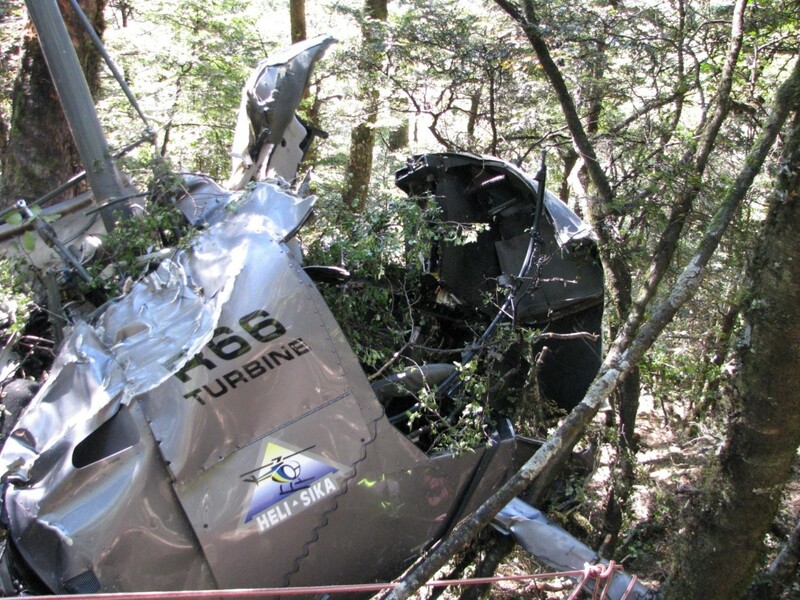 - Four of the seven fatal R66 accidents that have occurred globally since the type was introduced into service in 2010 were mast bump or low-main-rotor-speed accidents. These are accident types seen with the smaller R22 and R44, which have the same main rotor design. However, the R66 was certificated without any special pilot training requirements to mitigate the risk of these types of accident. - At the time of this accident the flight manuals for Robinson helicopters did not adequately warn pilots of the hazardous operating practices and environmental conditions that can lead rapidly to a catastrophic mast bump. - Earlier research into the flight control systems and dynamic behaviour of the main rotor of lightweight helicopters, for example, the design used by Robinson, was not completed as intended. Until the behaviour of such rotor systems in conditions of low G and turbulence is fully understood, it is possible that not all of the causal factors of mast bump accidents will be identified. - The in-flight break-up was caused by a mast bump and main rotor blade contact with the fuselage. - The mast bump very likely occurred when the helicopter encountered moderate or greater turbulence, which likely resulted in a condition of low G. The effect of any turbulence would have been exacerbated by the helicopter's light weight and estimated airspeed of 115 knots. - The possibility that an intentional or inadvertent control input by the pilot contributed to the mast bump cannot be excluded. - The R66 global accident history, in the five years since the type was introduced into service in 2010, suggests that the R66 is as vulnerable as the smaller R22 and R44 to a catastrophic mast bump under certain conditions. - The R66 was certificated without any special pilot training requirements to mitigate the risk of a catastrophic mast bump. - At the time of the accident, the Robinson helicopter flight manuals did not adequately warn pilots of the hazardous operating practices and environmental conditions that can lead rapidly to a catastrophic mast bump. This type of accident is strongly associated with turbulent conditions. - There is insufficient industry knowledge of why Robinson helicopters are particularly vulnerable to catastrophic mast bump events. - In spite of the lack of reference in the operator’s exposition to mountain flying training, the pilot's training was unlikely to have been a factor in the accident. - That he extend the knowledge and training requirements of Special Federal Aviation Regulation No. 73 to pilots of the Robinson R66 helicopter. - That he reinstate research into the dynamic behaviour of two-bladed, teetering, underslung rotor systems, taking full advantage of available technology, with the aim of achieving the original goal of National Transportation Safety Board (United States) recommendation A-96-12. - That he include the knowledge and training requirements of Special Federal Aviation Regulation No. 73, or an equivalent requirement, as a prerequisite for the issue of a Robinson R66 type rating. - That he promptly publicise the recent amendments to the Robinson R66 and R44 Pilot’s Operating Handbooks that caution against flight in high winds and turbulence, and which advise pilots to reduce power and speed if turbulence is expected or encountered. - Pilots must be familiar with the complete Pilot’s Operating Handbook for each aircraft type that they fly, as well as the approved flight manuals. - Pilots of Robinson helicopters, regardless of their experience, should avoid areas of high winds or turbulence, and closely adhere to the manufacturer's advice to reduce airspeed if turbulence is encountered.